Please see important shipping information below. 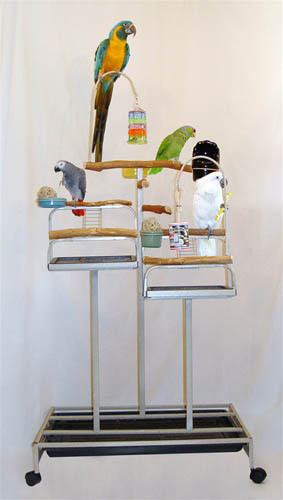 center pole supporting wood perch - 44"
left Traveler Deluxe pole - 27"
right Traveler Deluxe pole - 22"
NOTE: When ordering please indicate the species of the bird who will use the stand so appropriate diameter perches can be provided. DESCRIPTION: This unique playstand provides area to roam with 5 perches, stimulating mental activity with foraging stations, and toy holders ... all of which combine to relieve boredom. Toys shown in product photo are not included, but check for some great toys here and at our foraging toys page. The Deluxe Foraging Station is the ideal place to stimulate your bird's natural need to forage which helps fill their need to work for food, etc. It just takes a little imagination to create "hide and seek" fun! Hide foot toys, treats and food throughout the Foraging Station by covering food bowls with paper (kraft paper works well) and tying it in place with bird safe rope. Chosen by Bird Talk Editors! SHIPPING INFORMATION. This playstand requires a shipping quote to be obtained for your approval. This quote reflects the actual shipping company’s charges for delivery to your city/zip code location. We have chosen to offer this playstand in this manner to provide the lowest prices and fairest shipping costs for your purchase. We request the lowest shipping quote available to your location. A shipping quote can be obtained before or after submitting your order. Before order submission please contact us by phone at (760) 723-8667 between 9am and 6pm PDT/PST, or you will be contacted with the quote information after your order is received and prior to processing.